This October, Corp! Magazines celebrated a decade of diversity. For the last 11 years Corp! has been celebrating Michigan’s businesses and leaders who have displayed significant achievement in diversity within their organizations and community. This year, our founder and CEO Molly MacDonald, received the Corp! 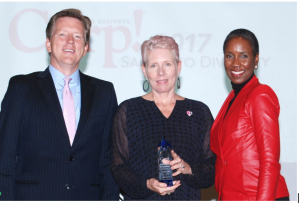 “Diversity Business Leader Award”, MacDonald was recognized for being a successful role model who embodies a vision that develops and supports diversity strategies and women’s advancement within her organization and beyond.